A sprawling archipelago of white sandy beaches, towering active volcanoes, seas abundant with marine life, rich rainforests, and dozens of ethnic cultures, it’s easy to see the traveller’s allure of visiting Indonesia. But even the most pristine of tourist attractions have a dirty little secret. Anyone who has spent time travelling through Indonesia will tell you there are countless beautiful places to explore. They will also tell you that challenges in the industry abound, including infrastructure and environmental issues, with the most noticeable being the problem of waste. Indonesia has ambitious goals of reaching 20 million tourists by the year 2019, a leap of 8 million from last year’s target. In 2015, tourism contributed 9.6 percent of the country’s gross domestic product (GDP), following behind the country’s main earners of coal, oil, gas and palm oil. Minister of Tourism Arief Yahya plans for the tourism industry to have doubled the national GDP by 2019, to US$24 billion annually. The Asian Development Bank has agreed to loan US$10 billion over the next five years to support these targets. In 2015, Indonesia was shamefully brandished with the ‘second largest polluter of plastic marine waste’ title, trailing only behind China, a nation that produces a third of the plastic garbage polluting the world’s oceans. Plastic pollution is indeed a global problem, with an estimated 8 million tonnes being released into the oceans each year. Not only is the problem physically huge, like the Great Pacific Garbage Patch – a floating island of trash in the Pacific Ocean twice the size of France – but recent studies are finding health effects on human beings can now be seen on a microscopic level in the food chain. A group of experts confirmed contamination has been found in tens of thousands of organisms and in more than 100 species of marine life. With Indonesia’s oceans boasting the highest levels of marine biodiversity in the world, as well as being one of the country’s primary tourist attractions, the government appears to have finally taken notice of the severity of the growing marine waste problem which could pose a threat to the country’s ambitious economic goals. Luhut Pandjaitan, Indonesia’s Coordinating Minister for Maritime Affairs, recently announced a US$1 billion a year pledge to reduce litter in the waters during the 2017 World Oceans Summit in Bali. By 2025, the government has grand plans to reduce the amount of marine waste by 70 percent. Pandjaitan plans to do so through the creation of new industries that use biodegradable materials like seaweed and cassava as alternatives to plastic. He will also introduce a nationwide tax on plastic bags and a public education campaign. Although this is a positive step in the right direction, is it too little too late? Many disgruntled tourists who have travelled from far to experience Indonesia’s beautiful beaches end up spending their holidays combing trash from the sand. They can be seen turning to social media to express their dismay at the situation. 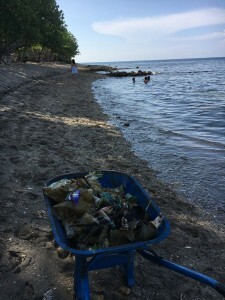 On April 20, holidaying Danish web developer Christian Hajdu shared his angst about how much garbage he picked up on a beach in Bali. “Imagine coming half way across the world to realize a dream in paradise like a beautiful beach just to find it covered in plastic waste!” he tweeted. the extremely littered trails and campsites are creating a negative image and could destroy the industry. 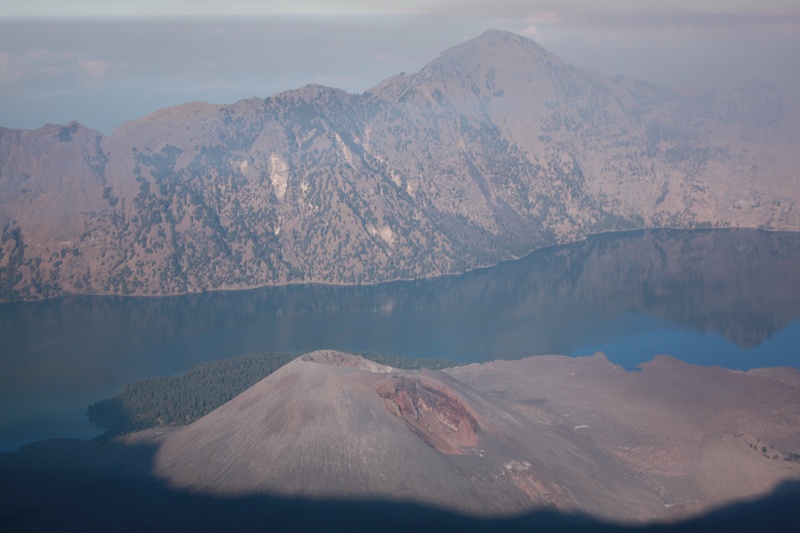 The Rinjani National Park is run by the government, and local guides who earn a living taking tourists up and down the mountain are complaining that the authorities are using the money for so-called ‘administrative’ costs in the capital. Each foreign visitor is required to pay Rp.150,000 (US$11) for the privilege of entering the park. If the Rinjani Trek Management Board (RTMB) collects Rp.150,000 from each foreign tourist, and an average of 2,000 climb the mountain in a month, that’s an income of Rp.300 million (US$22,000). It’s no wonder authorities are fighting over the funds. Upon reaching their second campsite, Vasiliadis and a group of around seven other hikers cleaned up the area and encouraged another group to do the same. 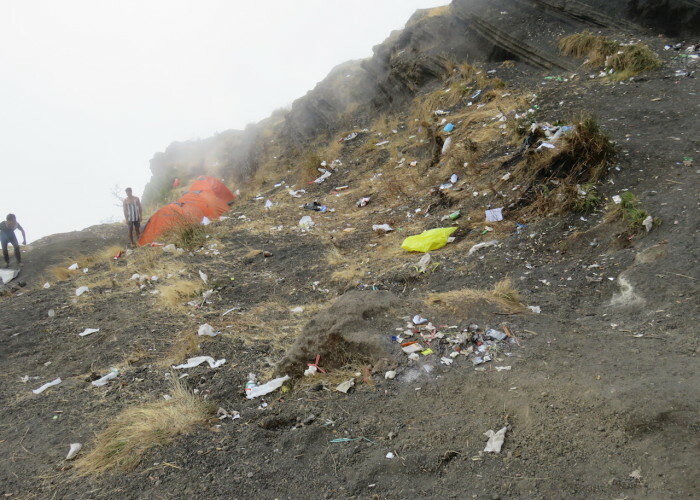 After speaking with their guide about the severity of the situation, they learned that many porters are not motivated to bring their garbage back down with them. Hikers should also share the responsibility, but it is often not the case, especially with local groups. Vasiliadis believes it comes down to a lack of education. “Not all hikers have the ‘hiking culture’ and understand the ‘leave only your footprints’ rule,” he says. Vasiliadis’ website focuses on raising awareness to international hikers wishing to climb Lombok’s majestic volcano. As the park is soon to be awarded the title of a UNESCO World Heritage Park, he believes it will receive even more visitors, which would make the situation much worse. “We hope to be able to perform an eco-expedition, which would include a clean-up, discussions with local villagers and hiking professionals, and put pressure on local authorities to take action,” he said.